Edmund LITTLE, Echoes of the Old Testament in the Wine of Cana in Galilee (John 2 : 1-11). The Multiplication of the Loaves and Fish (John 6 : 1-15), (Cahiers de la Revue biblique 41), Paris : Gabalda, 1998. 24 cm. 210 p. ISBN 2-85021-110-9. FF 240. Udo SCHNELLE, The History and Theology of the New Testament Writings, London : SCM, 1998. 23 cm. 573 p. ISBN 0-334-02730-6. £ 19,95. 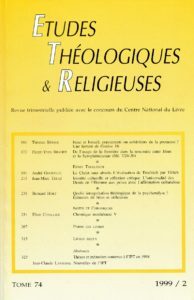 Daniel MARGUERAT, Yann BOURQUIN, Pour lire les récits bibliques. La Bible se raconte. Initiation à l’analyse narrative, Paris/Genève/Montréal : Cerf/Labor et Fides/Novalis, 1998. 21 cm. 241 p. ISBN 2-204-06114-X/2-8309-0910-0/2-89088-991-2. FF. 150.